Myth: Goldfish have a three second memory. In fact, goldfish actually have very good memories for fish. They can be trained to respond various ways to certain colors of light; different kinds of music; and other sensory cues. Not only that, but they seem to be able to remember things they are taught as much as a year later. Researchers have successfully taught goldfish to play fetch, push levers, do the limbo, and even play soccer. If they are fed around the same time of day, they also remember that and will anticipate the feeding leading up to that time, which implies they have a very good sense of time. Goldfish also have been shown to be able to recognize their masters and even pick their favorites (usually the one who feeds them). Around certain people the goldfish is very familiar with, they will often be much more active when they see the person and even sometimes stop considering the person any sort of threat, including if that person sticks their hand in the water and tries to touch them. Around strangers, on the other hand, the goldfish will often hide. Blind goldfish also exhibit this same type of behavior, except they respond to the voice of their owner, similarly to how the non-blind goldfish respond to the sight of their owner. In one experiment, researchers even got the goldfish to learn that if they pressed a certain lever at a certain time of day (for a span of about an hour), they would get food for this action. If the lever was pushed any other time of day, nothing would happen. In very short order, these goldfish learned to only bother pushing the lever during the time of day it would produce food; the rest of the time, they ignored it. In another experiment, researchers trained young goldfish to associate a certain sound with feeding time. They then released these fish into the sea. About half a year later, when the fish were fully grown, the researchers broadcast the sound over a loudspeaker and the fish swam from wherever they were in the sea, back to where they were released. This has been proposed as a method to cut down the cost of raising fish for consumption. Teach them to come when they are young and then release them into the ocean and lakes to grow to adulthood naturally. Better for the environment; less cruel to the fish (relatively speaking); and cuts down on costs of raising the fish drastically. Researchers have also recently taught carp (goldfish are a type of carp) to distinguish between classical music and blues music, as well as to be able to distinguish between whether a particular song is being played forwards or backwards. 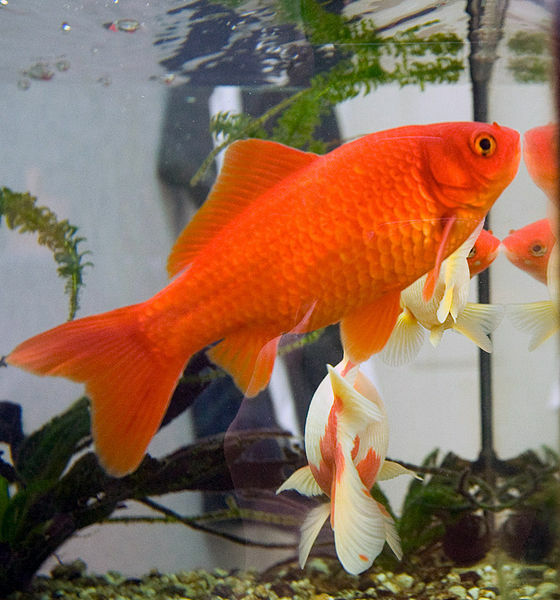 Because of the fact that goldfish are very intelligent for fish, experts recommend that you regularly change their fish tank around and make it as intricate and complicated an environment as possible with lots of things for the fish to interact with. Doing this has been shown to make the goldfish much more active and extends their average lifespan. Goldfish and other types of carp are a great fish to add to stagnate bodies of water that are breeding grounds for mosquitoes. The goldfish and other carp eat the mosquito larvae and they are hardy enough to survive in this type of water environment where many other types of fish couldn’t. As noted, goldfish are a type of carp, specifically a less colorful version of carassius auratus. Goldfish were first domesticated by the Chinese over a thousand years ago. The first record of some of the domesticated gray and silver carp producing orange and yellow offspring was recorded during the Jin Dynasty in 265-420. During the Tang Dynasty (618-907), it became popular to breed the gold and yellow varieties, instead of the silver, for placing in watergardens. Because yellow was an imperial color, in 1162 Empress of the Song Dynasty forbid anyone outside of the imperial family from keeping yellow goldfish, which is thought to be why the orange goldfish variety is more common today, even though the yellow variety is easier to breed. Today there are over 125 different kinds of goldfish, thanks to selective breeding beginning over a thousand years ago. The largest goldfish ever found was 19 inches, measured in 2008, and currently lives in the Netherlands. These findings I can verify! I’ve had a fish pond in my yard for 11 years. The fish would come when called for food; going to the surface immediately and making their “baby bird imitations.” They also knew the time of day when they were to be fed and were generally already waiting. Because they had never been harmed, they would swim around my arms when I was cleaning the filter, etc. I could even get IN the pond to fix things and they would swim around me with no fear. Over a month ago, I looked out the window to see a Great Blue Heron on my railing. The pond was in disarray and 8 of my 13 fish were gone; eaten. I have five left. One had a gash on her side and stayed huddled with one other fish; that fish didn’t leave her side for days. The point is, though, that these fish have certainly remembered! They hid most of the time; never did before. They will not come out for food when called; but will wait for me to go away; then they go very rapidly to the surface, grab food, and go right back into hiding. Obviously, I now cover the pond when I’m not there; I have a netting over it. They are only beginning to swim around a bit when I am out there; mostly they hide. These fish had been here all their lives and were very, well, friendly! Now they are very skittish and afraid..and that was a month ago. These fish remember..and I can only hope they will learn to trust again! Cute article, but one thing…. Goldfish are freshwater. They do not, and can not, and never will be able to live in “the sea”. @Fishies: I believe the researchers in question used the word “sea” in the less common definition of “large body of water”, rather than the more common “ocean”. @Tea: Thanks for catching that, fixed! Learned something new today! 😀 Always fascinated by how incredibly interesting these creatures are than what most people give them credit for. It still blows my mind that they can remember things for so long (when food is involved of course). I have recently bought 2 fancy goldfish. They were positioned in my bedroom but the filter was too noisy so I moved them into the lounge. When in the bedroom I always spoke and fed them on the very left side of their low level indoor pond. When in the lounge due to a big chair in the way I looked and spoke to them from the right hand corner of the tank due to not being able to get to the left side but reached my hand to the left corner as I knew they were used to that. What I found amazing was the fact they straight away swam directly to me on the left and only briefly swam to the left to grab there food and back to me again on the right. This indicates to me that they definitely know me, rather than hanging around my hand for the food.